in this PART, we will install VMware Tools in the VM..
Graphics Performance: VMware Tools installs a SVGA driver that increases video refresh. Efficient Memory Allocation: A memory control driver that is installed with VMware Tools provides increased efficiency in memory allocation. Accelerated Mouse Driver: For increased mouse responsiveness. Optimized SCSI Driver: A Bus Logic SCSI driver provides faster I/O performance for some guest OS. The Tools control panel lets you modify settings. Run Scripts: Scripts can be defined to run after particular events such as the VM starting up or shutting down. Shrink the Virtual Disk: By reducing the amount of disk space a VM’s virtual disk takes up by removing empty unused space will lead to more usable storage on your hosts volume. When you choose VM > Install VMware Tools from the VMware Workstation menu, VMware Workstation temporarily connects the virtual machine's first virtual CD-ROM drive to the ISO image file that contains the VMware Tools installer for your guest operating system and you are ready to begin the installation process. Double-click the VMware Tools CD icon on the desktop. NOTE: In some Linux distributions, the VMware Tools CD icon may fail to appear when you install VMware Tools within an X windows session on a guest. Launch the VMware Tools CD. You will see the Vmware-Tools.tar.gz file as shown below. Right Click on that and select Extract To..
Once extraction completes, make sure the extracted folder is present at the place you wanted it to be. Respond to the questions the installer displays on the screen. Press Enter to accept the default value. NOTE: Be sure to respond yes when the installer offers to run the configuration program. NOTE: Some guest operating systems require a reboot for full functionality. 1. Power on the virtual machine. 2. After the guest operating system has started, prepare your virtual machine to install VMware Tools. Choose VM > Install VMware Tools. The remaining steps take place inside the virtual machine. 3. As root (su -), mount the VMware Tools virtual CD-ROM image, change to a working directory (for example, /tmp), uncompress the installer, then unmount the CD-ROM image. NOTE: Some Linux distributions automatically mount CD-ROMs. If your distribution uses automounting, do not use the mount and umount commands below. You still must untar the VMware Tools installer to /tmp. 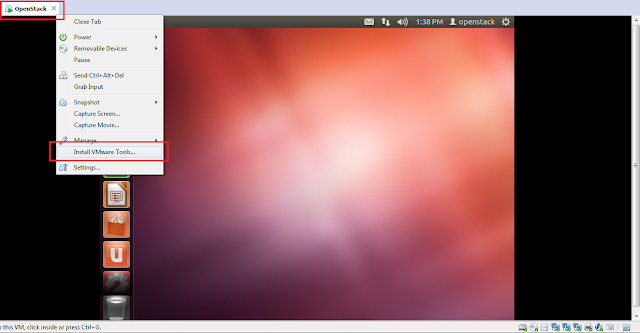 Some Linux distributions use different device names or organize the /dev directory differently. If your CD-ROM drive is not /dev/cdrom or if the mount point for a CD-ROM is not /mnt/cdrom, you must modify the following commands to reflect the conventions used by your distribution. Where <xxxx> is the build/revision number of the VMware Workstation release. NOTE: If you attempt to install a tar installation over an rpm installation — or the reverse — the installer detects the previous installation and must convert the installer database format before continuing. Respond to the configuration questions on the screen. Press Enter to accept the default value. 6. Log off of the root account. 8. In an X terminal, launch the VMware Tools background application. Note: You may run VMware Tools as root or as a normal user. To shrink virtual disks, you must run VMware Tools as root (su -). In PART 3 of this series, I'll show you how to ADD A EXTERNAL HDD TO Ubuntu 12.04 AND THEN MOUNT IT ! !